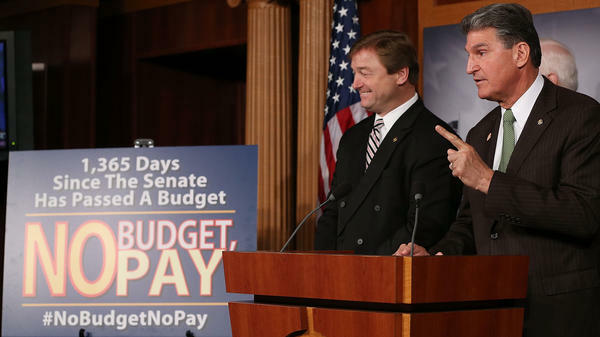 Sen. Dean Heller (left), R-Nev., and Sen. Joe Manchin, D-W.Va., speak Wednesday at the U.S. Capitol about legislation to delay a potential clash over the debt ceiling until May — and to freeze the paychecks of lawmakers if they don't pass a budget resolution. As if the federal budget process isn't confusing enough, now we get the fog of partisan war created by the charges and countercharges flying between congressional Democrats and Republicans. Republicans accuse the Democrats who control the Senate of shirking their duty by not producing "a budget" in recent years; Democrats accuse Republicans of not telling the whole truth. What's going on? Here are five points to consider. First, it is true that Senate Democrats haven't produced what's called a budget resolution in four years. But they claim they don't actually need to pass what is in reality a nonbinding budget blueprint — and that to have done so in the past two years in particular would have been redundant. That's because the Budget Control Act of 2011, enacted to solve that summer's debt-ceiling crisis, explicitly said its spending restrictions would take the place of Senate budget resolutions for fiscal years 2012 and 2013. "Any comments, any conversation, any statements made by the Republicans about our not having a budget is false. It's untrue. We passed the Budget Control Act. We passed it with the help of Republicans. We didn't have to do a budget. You folks listen to that. Stop taking that bait." Former Sen. Kent Conrad, a North Dakota Democrat, made a similar point last year in a YouTube video. Conrad stressed that the 2011 law, as an actual statute, trumped any nonbinding resolution. Still, there's a perfectly understandable reason why not every Senate Democrat has been champing at the bit to produce budget resolutions, and this is the second important point. They're often not worth the paper they're printed on — yet they can come back to haunt a lawmaker. Budget resolutions aren't laws. The president doesn't sign them. Instead, they set out congressional priorities for taxing and spending. While the Budget Control Act of 1974 instructed both chambers to pass the resolutions, there's no penalty for failure. Indeed, since 1999, several years have seen Congress fail to pass the resolutions. More important than the resolutions is legislation that appropriates money to federal agencies and programs. As anyone who has been paying attention knows, the lack of resolutions obviously hasn't stopped the government from functioning. What the budget resolutions can do, however, is put a senator on record on an issue that could prove unpopular electorally in his or her state, such as voting against a tax cut or for increasing spending. This is particularly worrisome for Democrats holding seats that are competitive between the major parties. And because in the Senate such resolutions can be amended by the Republican minority to force some Democrats into taking difficult votes, there can be some benefit to avoiding the issue altogether. Which brings us to the third point. Senate Democrats find themselves in a damned-if-they-do, damned-if-they-don't situation, since House Republicans have deftly used the lack of Senate budget resolutions as a handy cudgel with which to clobber Senate Democrats. Most Americans probably don't understand why Senate Democrats haven't produced a budget resolution, and see this as partly explaining the nation's fiscal problems. Republican arguments that even families have to produce a budget, so why not the Senate, have a certain common-sense appeal. So Senate Democrats now say they will produce a budget resolution. That hasn't stopped congressional Republicans who control the House from continuing to use the issue as a weapon, or from taking credit for forcing the Democrats' hands. It was language Republicans added to a debt-ceiling extension bill the House passed Wednesday — language that would stop lawmakers from being paid if they failed to produce a budget resolution by a deadline — that led Democrats to move, Republicans said. "It's interesting to note, after almost four years having passed with an economy that's been struggling, the Senate never acted. It took one week in which their paychecks were on the line, that now the Senate's going to step up and do the right thing. We welcome them to this debate around the budget of the nation and look forward to making sure we can begin to reduce the mountain of debt that is facing our children." "Now, this morning I announced that the Senate will be moving a pro-growth, pro-middle class budget resolution through the committee and to the Senate floor. I discussed this path with my colleagues in the weeks before I officially became chair, and we plan to move on a budget resolution regardless of whether the House rolls this issue into their short-term bill to increase the debt limit. "But I'm hopeful that when Republicans say they want to return to the regular budget process they actually really mean it. That means that the constant crisis over manufactured deadlines needs to end, the brinkmanship needs to stop, and they truly need to work with us toward the balanced and bipartisan budget deal that the American people expect and deserve." Here's the fourth point. In a statement Murray issued Wednesday, she said that by producing a budget resolution with their priorities, Senate Democrats will be able to create what they hope will be a contrast favorable to them against the budget produced by Wisconsin Rep. Paul Ryan, the 2012 Republican vice presidential nominee. "Democrats are eager to contrast our pro-growth, pro-middle class budget priorities with the House Republicans' Ryan budget that would end Medicare as we know it, gut investments in jobs and programs middle class families depend on, and cut taxes for the wealthiest Americans and biggest corporations. We know that when our priorities are laid out next to Republicans', the public stands with us." That raises the fifth point. It should be really fascinating to watch Senate Democrats try to achieve consensus on a budget resolution. The resolution will need to get through a budget committee comprising 10 Democrats, two independents who caucus with the Democrats, and 10 Republicans. Assuming Murray is unable to get a single Republican vote, a safe assumption, she will need to get all of her Democrats and independents on board. If a single Democrat/independent votes "no" on the eventual resolution, it will die in committee, assuming all committee members vote. Getting her dozen senators to agree could test Murray's cat-herding abilities to their limits. The committee includes Democrat Mark Warner of Virginia, who has indicated in recent years that he would be open to entitlement cuts, and Bernie Sanders of Vermont, the independent who has vowed to fight such cuts. It also includes three untested freshmen worth watching: Tim Kaine, the very centrist Democrat from Virginia; Tammy Baldwin, the very progressive Democrat from Wisconsin; and Angus King, the independent from Maine, who upon agreeing to caucus with Democrats (which allowed him to secure such plum assignments as a seat on the budget committee) declared that he would not be "in automatic opposition" to the GOP. There could be an intraparty battle over the budget blueprint lively enough to rival the coming clash between Democrats and Republicans.